In 1858, 35 acres of waterfront on Salem’s Neck was designated a public park. 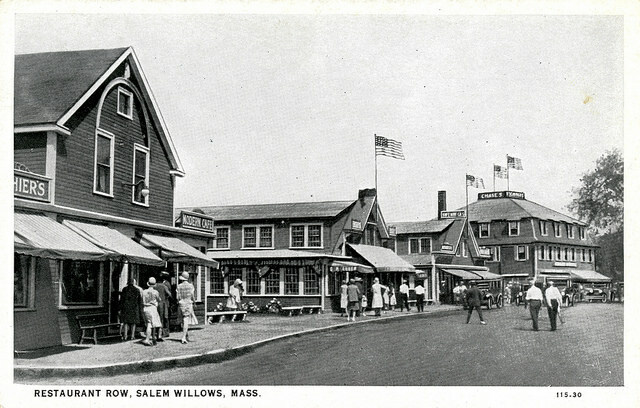 The park was named Salem Willows due to the white willow trees that had been planted in that area in 1801. The trees originally offered shade to smallpox patients as they were treated by a hospital for contagious disease, which stood nearby. When the hospital closed, the trees and waterfront created a great escape from the city’s summer heat, for locals and tourists alike. 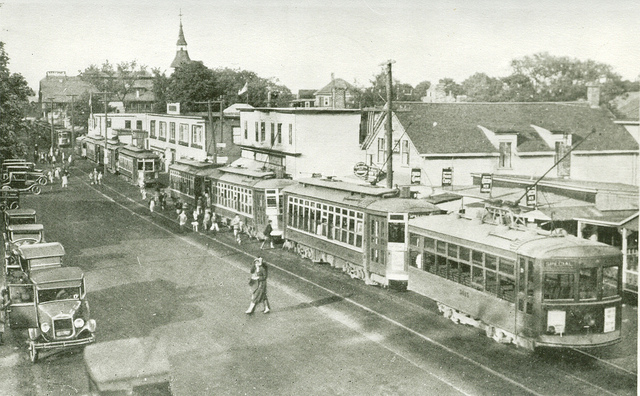 The park steadily grew as a destination with the Naumkeag Street Railway offering frequent horse-drawn trolley rides from Salem’s downtown. With this success, an amusement park was built on an adjacent lot, which opened in June 1880. Attractions included a skating rink, restaurants, and a theater. 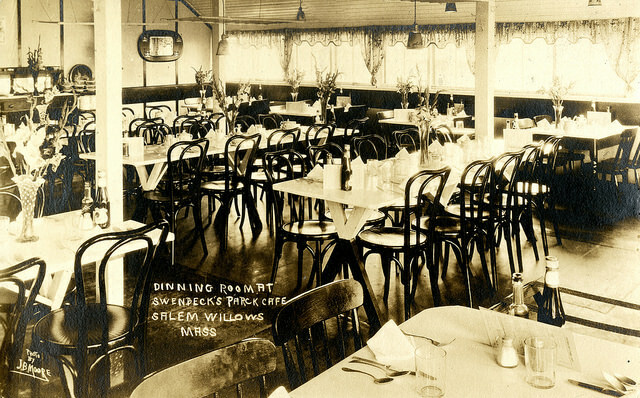 Starting In the 1870s, a group of restaurants opened along the Willow’s north shore. This stretch would become known as Restaurant Row and gained notoriety for “shore dinners” which were featured. 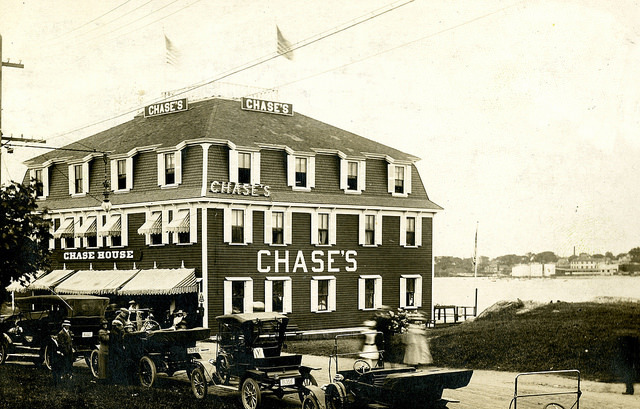 Restaurant Row was anchored by Chase House, Swenbeck’s, and Ebsen’s, all of which specialized in seafood and ocean views. After nearly eighty years in operation these restaurants began closing their doors in the 1940s. On July 15, 1952, a fire consumed Chase House, the first in a series of fires and storms that ultimately destroyed Restaurant Row. 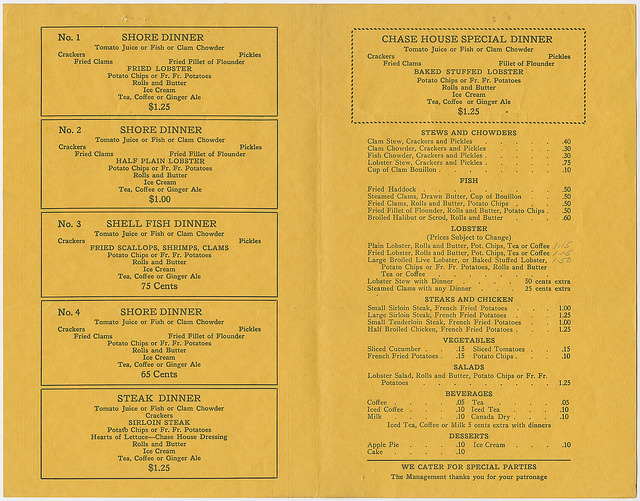 Chase House on Restaurant Row menu.